The reality of the Trinity, in which the persons of God live in perfect oneness, is not a dry, dogmatic fact. Here Christ ***defines salvation***; to be one with each other and God, even as God is one with Himself. This should put loving our neighbor, and being peacemakers, not judging etc – anything that promotes unity with our neighbor – in an important perspective. There is a profound external difference between the unity of God with Himself and our unity with our neighbor, but it is unimportant. God is in perfect unity with Himself; each person gives and receives love exactly identically. It is not like this in human relations, even among those who love each other, because of our lamentable and individually variable tendency to prise, vanity, and self-centeredness. God loves the good and the evil equally, and herein is the key to perfect unity with Him. Let us keep in mind that the Golden rule is to act towards our neighbor as we would *want* to be treated, not *AS* we are treated! Every interaction with our neighbor leads us into deeper unity with God (the only purpose of our life!) or estranges us from Him. This is a stark reality that we rarely acknowledge, but those who are holy know well. May God heal us of our preoccupation with ourselves and help us to love our brother, having only one expectation: to be one with God, even as He is. How are you doing on your reading of John? We are finishing the 16th chapter today. 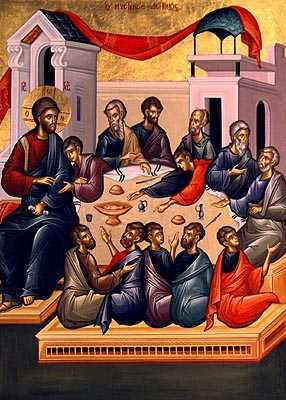 We are headed to the end, on the leave-taking of Pascha (the day before Ascension, next week). I am not concerned if you are reading at a slower pace, but as your pastor I am very concerned of you are not reading at all or very haphazardly! We must read the Scriptures, especially the Gospels and the Psalter, and ponder them. They are the words of eternal life. In the 16th chapter of John, Christ is preparing His disciples for is upcoming passion, on the very night of His arrest. Judas the betrayer of Christ did not hear these words. There is a great and deep well of theology here, a Christological treasure trove. It must be understood, and this happens over time and with repetition – of reading the Scripture texts and living the Christian life. There is something else in this chapter that is too beautiful to talk about properly. It is so wondrous that we cannot explain it, because it promises things that "eye hath not seen, nor ear heard". Our Lord describes our*end* state, the fruit of our labors. This is the entire and only goal of life – perfection in Christ. In the next chapter, Our Lord will pray his high priestly prayer and give His definition of eternal life "And this is eternal life, that they may know Thee and Jesus Christ, whom thou hast sent" (John 17:3). I have quoted this verse more than any other, because it is a succinct summary of our only purpose in life, and the answer to that question that I ask so often (and re-ask myself often) – "What is the purpose of your life?" In the selection above, Jesus describes our state of being in eternal life. The perfect man has no need to seek for anything, since he wants in nothing. Therefore, he has no need to pray to the Lord. Here we understand prayer in a narrow sense – to ask the Lord for things we need. Of course, perfect prayer actually leads to a state of no prayer – just the state of perfectly being in the presence of the Perfect One. In this world, we are commanded to ask. The Scriptures are replete with these commands. We ask because we need. When we no longer need anything, we will have no reason to ask! therefore the Lord promises us that "in that day ye shall ask me nothing". I yearn for that day. It seems impossible to my feeble mind that I can be totally perfect, without any lingering passions. There are many things in my life that I have conquered, in the sense that I do not do them, and am not even attracted to them, but I cannot say that I still am never tempted by them. Jesus is describing the full restoration of the human will to the Edenic state. We are made in the image of God, and simplistically, that means that we are given the gift of free will. This is the ability to do what is good , always, and without labor (it is NOT the ability to do anything, good or bad, because doing bad destroys free will). We poor ones have learned to do good, but most of the time, it is with labor, and sometimes great and bitter labor. Never forget what you are laboring for! You are laboring to have joy that cannot be taken away from you; you are laboring to be free from labor. This is the only perfect freedom. Nothing else that man calls freedom is freedom. In this world, we cannot have perfect joy, but we can labor for it, and God will give it to us, because He has promised. He will fully heal our suffering souls, and repair our will so that it is perfectly free, as His is. This is the outstanding promise of Christianity, and I never grow tired of talking about it or meditating on it. This is the reason I became an Orthodox Christian. For a time (a little over a year), I was someone who believed, in a typical sort of "Protestant Evangelical" way, but I never heard these things from my eager and honest peers, nor from any literature. I remember how excited I was when I understood that Christ promises perfection and not just forgiveness. As I have grown in the faith all these years, I have learned that the whole of our ascetical theology focuses on this reality. It is notable that the Lord promises this perfect freedom and joy to His disciples (and to us), when they were experiencing great pain, sorrow and confusion. The next hours would bring about great sins within them, and their weak wills would crumble. So it is with us. We labor and work, and still our wills are weak and we fall, but as we progress in the Christian life, there are glimpses of the freedom and joy that Christ promises to us, and we are encouraged in our labors. 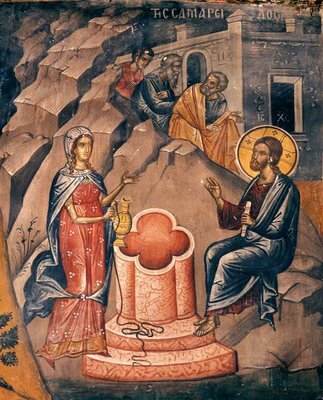 Synopsis: The conversation and conversion of the Samaritan woman by the well, recorded only in John, is the conversation of Christ with the soul. This is good news for us, as the future Equal to the Apostles Photini (Svetlana) was not a good woman – she had many sins – and we are not good either, however, she listened to the Lord, even as He sternly corrected her false beliefs and immoral lifestyle. The same conversation is happening to us, every day. Are you listening? Do you know how to listen? St Photini teaches us. John 4:5-42 5 Then cometh he to a city of Samaria, which is called Sychar, near to the parcel of ground that Jacob gave to his son Joseph. 6 Now Jacob's well was there. Jesus therefore, being wearied with his journey, sat thus on the well: and it was about the sixth hour. 7 There cometh a woman of Samaria to draw water: Jesus saith unto her, Give me to drink. 8 (For his disciples were gone away unto the city to buy meat.) 9 Then saith the woman of Samaria unto him, How is it that thou, being a Jew, askest drink of me, which am a woman of Samaria? for the Jews have no dealings with the Samaritans. 10 Jesus answered and said unto her, If thou knewest the gift of God, and who it is that saith to thee, Give me to drink; thou wouldest have asked of him, and he would have given thee living water. 11 The woman saith unto him, Sir, thou hast nothing to draw with, and the well is deep: from whence then hast thou that living water? 12 Art thou greater than our father Jacob, which gave us the well, and drank thereof himself, and his children, and his cattle? 13 Jesus answered and said unto her, Whosoever drinketh of this water shall thirst again: 14 But whosoever drinketh of the water that I shall give him shall never thirst; but the water that I shall give him shall be in him a well of water springing up into everlasting life. 15 The woman saith unto him, Sir, give me this water, that I thirst not, neither come hither to draw. 16 Jesus saith unto her, Go, call thy husband, and come hither. 17 The woman answered and said, I have no husband. Jesus said unto her, Thou hast well said, I have no husband: 18 For thou hast had five husbands; and he whom thou now hast is not thy husband: in that saidst thou truly. 19 The woman saith unto him, Sir, I perceive that thou art a prophet. 20 Our fathers worshipped in this mountain; and ye say, that in Jerusalem is the place where men ought to worship. 21 Jesus saith unto her, Woman, believe me, the hour cometh, when ye shall neither in this mountain, nor yet at Jerusalem, worship the Father. 22 Ye worship ye know not what: we know what we worship: for salvation is of the Jews. 23 But the hour cometh, and now is, when the true worshippers shall worship the Father in spirit and in truth: for the Father seeketh such to worship him. 24 God is a Spirit: and they that worship him must worship him in spirit and in truth. 25 The woman saith unto him, I know that Messias cometh, which is called Christ: when he is come, he will tell us all things. 26 Jesus saith unto her, I that speak unto thee am he. 27 And upon this came his disciples, and marvelled that he talked with the woman: yet no man said, What seekest thou? or, Why talkest thou with her? 28 The woman then left her waterpot, and went her way into the city, and saith to the men, 29 Come, see a man, which told me all things that ever I did: is not this the Christ? 30 Then they went out of the city, and came unto him. 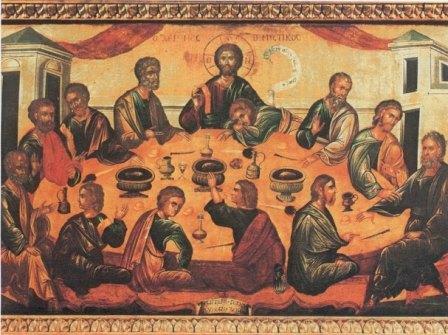 31 In the mean while his disciples prayed him, saying, Master, eat. 32 But he said unto them, I have meat to eat that ye know not of. 33 Therefore said the disciples one to another, Hath any man brought him ought to eat? 34 Jesus saith unto them, My meat is to do the will of him that sent me, and to finish his work. 35 Say not ye, There are yet four months, and then cometh harvest? behold, I say unto you, Lift up your eyes, and look on the fields; for they are white already to harvest. 36 And he that reapeth receiveth wages, and gathereth fruit unto life eternal: that both he that soweth and he that reapeth may rejoice together. 37 And herein is that saying true, One soweth, and another reapeth. 38 I sent you to reap that whereon ye bestowed no labour: other men laboured, and ye are entered into their labours. 39 And many of the Samaritans of that city believed on him for the saying of the woman, which testified, He told me all that ever I did. 40 So when the Samaritans were come unto him, they besought him that he would tarry with them: and he abode there two days. 41 And many more believed because of his own word; 42 And said unto the woman, Now we believe, not because of thy saying: for we have heard him ourselves, and know that this is indeed the Christ, the Saviour of the world. You are currently browsing the Saint Nicholas Orthodox Church blog archives for June, 2013.